Many gay people are acknowledging a need for a more meaningful way of living to avoid a motionless and purposeless existence. 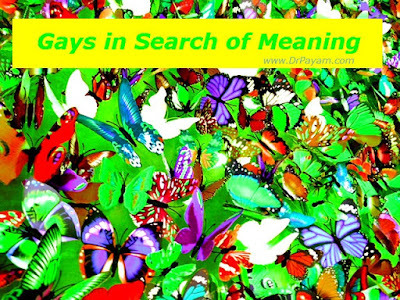 Lack of depth and meaning has caused many gay people to experience feelings of boredom and emptiness. Such feelings have forced many to look for something outside of themselves in order to feel content. Some indulge in drug use, excessive drinking, or brief romantic affairs, while others might engage in excessive shopping, traveling, or overeating in order to cope with their negative emotional states. Even though such activities might feel pleasurable and provide a momentary sense of euphoria, they do not lead to a real experience of vitality and aliveness. There is a different kind of intoxication that involves the experience of the soul. Such experience is beyond the ego’s need for cheap thrills. By embracing what is inherently sacred about our gayness, we can start to live a soulful life. While we, as a community, fight against discrimination and progress toward equality, we need to take time to embrace the numinous qualities inherent in being gay. We need to honor the spirit that exists within our gay souls. For the most part, our current culture places a great deal of emphasis on maximizing one’s pleasure through consumerism and minimizing one’s need for a deeper purpose in life. Couple that with internalized homophobia, which prevents gay people from gaining a deeper understanding of gayness. Internalized homophobia is the internalization of shame that many gay people have been forced to experience growing up in a heterosexist society. By working through this internalized homophobia, a path toward an understanding of the deeper meaning of gayness can become more accessible. A love that begins in a romantic relationship needs wings to fly beyond the field of personal connections and into the realm of the transpersonal. We help such love to grow wings by attending to our inner garden and weeding out toxic shame. The more we embrace our gayness with a sense of pride, the more room we can make to love and approve of ourselves. On our journey inward toward our true essence, we need to deal with the mind. Our mind can be like a wild horse that, through meditation, needs to be tamed and taught to bow down to our heart. The heart is where the flowers of Divine love bloom and the fragrance of such love fills our inner emptiness. We can connect with the sacred place in our heart by gently closing our eyes and concentrating on anything in the universe that helps to generate feelings of love in our heart. Neuroscience tells us whatever we focus on becomes our reality. In other words, “You energize anything that you give your attention to.” So why not energize the feelings of love in your heart? This is how we can embrace our true essence and add more love to the world. Humanity is facing difficult choices pertaining to our future survival on the planet. Given the threats of climate change, war, poverty, racism, homophobia, and mass shootings, we as gay people more than ever need to participate in the healing of the world. We can make a difference. Triumphs like the way we took care of our dying people during the AIDS crisis when the Reagan administration turned its back on us and how far we have come in our struggle for equal rights are truly a reflection of how courageous we are as a community. Our courage can continue, and we can advocate for issues that can make this world a better place. By honoring our gayness and letting it become a strong foundation to stand on, we can “love the world back to health.” Our involvement in helping the world can also add meaning and purpose to our own individual lives. By focusing on the love in our heart and cultivating an awareness of the world soul (Anima Mundi), we can trigger an awakening of healing energy that could transform our current civilization. LGBT people are only a small percentage of the population, but our contributions to helping solve our current global problems can be enormous. 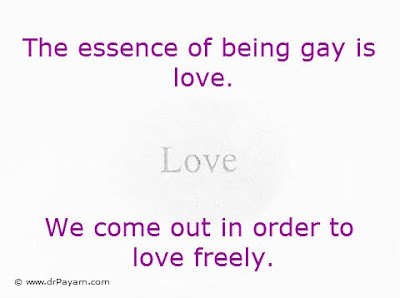 When we connect our gay soul with the soul of the world, not only do we start tapping into a deeper purpose for our existence, but we also begin to experience the oneness of life. One of the possible myths we can hold in our minds and imaginations to enrich and explain our homosexuality to ourselves is the Mahayana Buddhist story of the androgynous bodhisattva who takes upon him/herself the suffering of the world in order to transform it. In the myth Avalokiteshvara/Kwan Yin thus reincarnates as everybody, taking on all possible reincarnations. Buddhist monks have been reciting the Bodhisattva Vows for centuries, agreeing to remain in the round of reincarnation to help others. Wouldn't being reincarnated as a gay man in the age of AIDS be a fulfillment of that vow? Not all homosexuals, of course, but among us--at least according to this myth--are bodhisattvas who've come back as gay men to save the world. Dr Ghassemlou expresses a beautiful idea that we find meaning and fulfillment by seeking to serve. I learned the story of the Bodhisattva from Joseph Campbell. Campbell says there are Three Wonders of the Bodhisattva: the first is that he is simultaneously both male and female transcending gender; the second is that he sees that there is no difference between time and eternity, between the world and nirvana, living in heaven now; and the third wonder is that the first two wonders are the same! It's just a story, of course. But what a nice way to think of one's homosexuality, as a witness to the world of how we could all live better lives. And so we have to.